First Thoughts on Galaxy S4 and Why You Don’t Need to Buy One! Here’s some of my first thoughts on the Samsung Galaxy S4 that was just announced officially. First, the Galaxy S4 will ship with the latest Android 4.2.2 Jelly Bean OS. Second, the Galaxy S4 will ship with Exynos 5 Octa-core 1.6Ghz processor (yes, that’s 8 cores!) or Qualcomm Snapdragon 600 Quad-core 1.9Ghz processor depending on the market. But my guess is that the U.S. will get the Qualcomm (due to LTE compatibility) while the rest of the world gets the Exynos 5 Octa-core. However, there’s a good chance that the U.S. might see the Exynos 5 Octa-core as we have seen with the Note 2, which shipped with same Exynos for the U.S. and international. The Galaxy S4 will also come with 2GB DDR3 memory, this should be plenty for all modern applications. Even for the latest HD games, the Galaxy S4’s processor will be fast, there’s no need for additional memory than 2GB in my opinion. 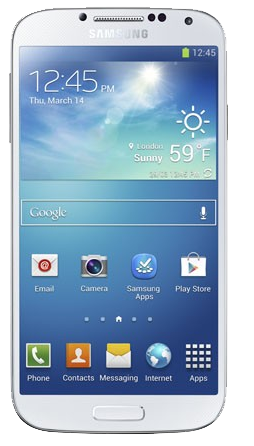 Third, the Galaxy S4 will come with a 4.99-inch Full 1080P HD 441PPI AMOLED screen. This is the world’s first AMOLED screen for a smartphone with 1080P HD and I am sure you will not be disappointed. That’s a nice upgrade from Galaxy S3’s 720P HD 306PPI AMOLED screen. The Galaxy S4 will ship with 16, 32, or 64GB versions along with external microSD card slot to extend additional 64GB. If there’s one thing Samsung is doing right, it’s storage as the consumer has the option of saving costs on storage and simply extending it later on with an external microSD card. This is an obviously smart move yet not enough smartphone manufacturers follow the trend. The Galaxy S4 will ship with a whopping 13 megapixel back camera and 2 megapixel camera, capable of running simultaneously in dual-mode for recording and video chatting. This follows the trend of many other smartphone makers like LG and it’s a good one. We will have to actually do a hands-on and compare with other smartphones but the specs live up to it. The Galaxy S4 will also ship with the latest MHL 2.0, this could mean better support/connections with your other HD devices like your TV for full 1080P mirroring/playback. The Galaxy S4 comes with an upgraded, bigger battery 2600mAh instead of S3’s 2100mAh. The big feature is the “removable” battery meaning you can go for days with extra batteries. Even with the latest smartphones with large batteries, it can be drained easily within hours of playing HD games. It makes more sense to put a removable battery, nevermind the size. Kudos to Samsung for this. The Galaxy S4 is actually about the same size as the Galaxy S3 with size of 136.6×69.8mmx7.9mm vs. 136.6×70.6mmx8.6mm. It’s actually smaller than the Galaxy S3 while the screen got larger. For weight, Galaxy S4 weighs 3 grams less than the S3 at 130 grams. Probably the coolest feature on the Galaxy S4 is that it works with gloves. This is going to be great for those of you who live in cold weather as you will be able to have a snowfight and use your phone with your gloves on. For S-Voice, the Galaxy S4 is better integrated while driving, voice commands supported with Bluetooth devices. There’s also Home Sync that allows up to 8 phones to pair with NFC, then push or pull your photos/videos whereever you may be through the interwebs. S Translate is kinda cool also as it translates another language in real-time, talks and understands many languages. Knox is a new feature for businesses and corporations, security developed by U.S. and will separate your personal and business life on your phone. Another really cool feature I thought was the Group Play, which enables music to play on 8 devices simultaneously, converting your phones into a 5.1 surround system. I personally have more than 8 and this is going to be great for me as I will dump my bluetooth speakers soon. And there’s even more stuff like dual video call with dual camera where your front and back camera are used while video-chatting with two others. Air Gesture? Yup, you will be able to answer calls or browse the web with your greasy burrito/pizza hands. Smart Scoll/Pause? Yes, pause videos when looking away – restart when looking at video. S health? Tracks calories, steps, and distance, pedometer built right into the Galaxy S4! IR sensor? Yes, your S4 can be used as a TV remote and digital channel guide. Those features are just tip of the iceburg and Galaxy S4 seems to have an abundance of features that other smartphone don’t. For all of those features that can be implemented using software, oh yeah, be glad as it’s coming as custom ROMs to your older Galaxy S2, Galaxy S3, Note 1, and Note 2. And of course, if you can afford it, just buy one. As an advice, I think it’s a great phone if you don’t already own a Galaxy phone and great upgrade from Galaxy S2. For Galaxy S3 users, you can hold out another year for Galaxy S5 or Note 3 and get your software upgrades via rooting and custom ROMs. Thanks Max. . . great review . . .entertaining and informative. Battery replacement *IS* really important and I also don’t understand HTC and others which don’t get that. Your point that many of the improvements are software that will filter down to the S3, and even the S2 is great news. My Galaxy S2 was great when I got it and still is perfect for my needs –rooted with all the newest features (so far 😉 If we can get some of the S4 features. . .well, I may never buy another phone! Will you post when mods are made so note 2 can have all s4 features? Next story What is AOSP?